Mahindra War room is one of the most awaited competition by students of SIBM Pune . This year’s Mahindra War Room gave opportunity to solve live cases and propose innovative solutions. The campus round was held at SIBM, Pune. After an exciting competition, the results for the campus round were announced and three teams from SIBM, Pune were declared winners. Also Aditya Ram and Praneet Rance were declared as best presenters. Post campus rounds, the next round was with competing teams across B Schools and one team titled “Ab ki baar hum chaar” from SIBM, Pune comprising of Pratik Gupta, Gagan Nagpal, Divya Bhardwaj and Nitin Nandan have been selected for the final round of Mahindra War Room 2016. The team is now gearing up for the finals , which is called the Platinum Tier. “Ab ki baar hum chaar” from SIBM, Pune will now compete with 7 teams from other B Schools and give their best to compete and win the Mahindra War Room 2016. I wish “Ab ki baar hum chaar” all the best for the Grand Finale- Platinum Tier – Mahindra War Room 2016 ! 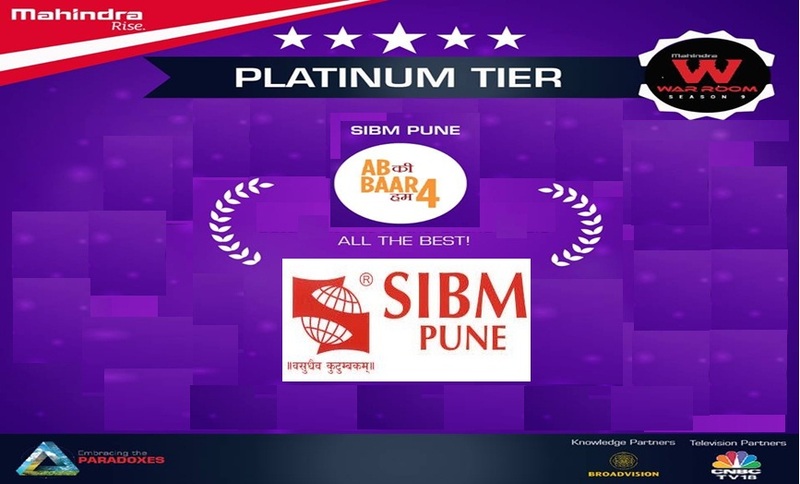 SIBM Pune in Mahindra War room 2016 – Grand Finale 5 out of 5 based on 3 ratings. 3 user reviews. The Week Magazine’s Hansa Research – Best B School Survey 2016 has been published !